On May 31, 2018, Fairgate Farm, located at 129 Stillwater Avenue, will introduce its first Farmers Market featuring organic produce from five farms. The Market will be open May through October on Thursdays from 12 noon to 6 pm and Saturdays 9 am to 12 noon. 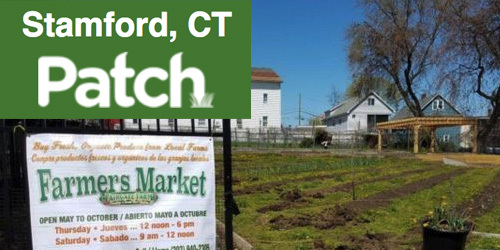 “The Farmers Market has been made possible thanks a US Department of Agriculture (USDA) Farmers Market Program (FMPP) grant Fairgate Farm was awarded to support the efforts to improve the access to and increase consumption of fresh, local food to the Stamford community,” explains Charter Oak Communities’ chief executive officer Vincent Tufo. The participating farms, rooted in over 500 years of organic harvest, include Gilberties’ Herb Farm and Sport Hill Farm from Easton, Connecticut; Ryder Farm from Brewster, New York; The Hickories from Ridgefield, Connecticut; and Fairgate Farm in Stamford. Visit our Farmers Market section or email FairgateFarm@gmail.com for details.